The Necklace Research Papers look at the characters in this novel, and how they have a desire to move from lower class to upper class in society. 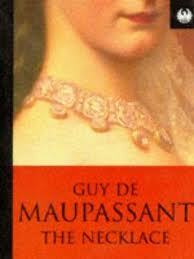 Research on the main characters of De Maupassant's story "The Necklace" reveals that both characters are similar in that they both have a desire to be a part of the social classes above them even though they have a comfortable life. They are different in that the strength of the desire is different in each, and the desire affects the lives of each in a different way. The desire of the woman, Matilda, makes her dissatisfied with her life as a whole. By contrast, the desire of the husband does not permeate his whole life. In a dinner scene with the couple, uncovering the meal in a tureen, the husband declares, "Oh! the good potpie. I know nothing better than that--"; while his wife is thinking "of the exquisite food served on marvelous dishes" of the upper classes at their meals. Whereas the desire of the husband can be satisfied with an occasional temporary experience of mingling with the upper classes, Matilda longs to change the status of her life by moving into the upper classes. The husband's receipt of an invitation to a ball to be given by the Minister of Public Education exposes the difference between the two. Mr. Loisel (as the husband is named in the story) is delighted. For him, going to the ball will be an enjoyable divertissement from his ordinary life. Matilda, however, doesn't even want to go to the ball because she sees it as only a mockery of her desire to be a part of the upper classes, who attend such balls regularly or give them and invite members of the lower classes such as herself. Matilda's husband persuades her to go by offering to buy an expensive new dress for her. But once Matilda gets the dress, she wants more--some jewelry to go with it. Matilda borrows what she thinks is a diamond necklace from her friend Mrs. Forestier. When Matilda discovers the necklace is lost when she and her husband return home after the ball, the similarities of the two characters are disclosed again. Without having to discuss it, each understands that they will have to replace Mrs. Forestier's lost necklace--and over the next ten years, each makes sacrifices to do so. They do not complain or try to get out of their obligation as they see it. Another way the two characters are alike is that despite the different ways they felt about being a part of a higher social status, they accept the penalties, or the sacrifices, that came with their desires to advance in social status. Social Class in American Literature research papers are custom written on Huck Finn, Gatsby and Invisible Man to name just a few. Paper Masters writes custom research papers on The Necklace and look at the characters in this novel, and how they have a desire to move from lower class to upper class in society.